Found in the antique fair at Northwich Memorial Hall for £2. 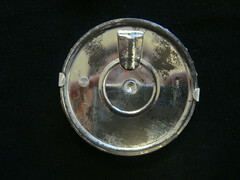 A tin from a bicycle repair kit...chalk dust to dry off the rubber tyre..
Another wonderful object from Angelica (posting them a bit at a time). Measures the number of miles you walk. Excellent for hiking shopping etc. 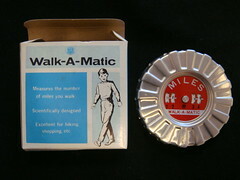 Your Walk-A-Matic Pedometer is a most useful toy. It is scientifically designed to work on exactly the same principle as devices selling for 10 to 20 times its price. The Walk-A-Matic will measure, with some accuracy , the number of miles you walk if you carefully follow these simple instructions. The Walk-A-Matic must be worn vertically. Simply hang it on your belt by the spring clip on the back. First, Set the Walk-A-Matic to zero (0) .Hold the outside rim of the Walk-A-Matic with one hand. At the same time turn the red dial clockwise with a slight finger pressure. Revolve the dial until you see the zeros come into place in all four windows. The numerals will move more slowly than the red dial; thus it requires many turns to reset to zero. Stop when the zeros are exactly centered on the white line that crosses the windows. Because each person walks with a different measured step, you must first find out how long yours is. To do this have some help you measure your NORMAL walking stride. (You may confirm this measurement by clocking an exact mile on an automobile speedometer, and then walking that identical distance with your Walk-A-Matic . The window that reads closest to 1 mile is the one you should always use. You'll have fun with Walk-A-Matic ! It will give you many miles of walking pleasure, either at home, hiking, or shopping.